This is the second annual visit of Alison McHugh and members of the music ministry of the Community of the Crucified, a Christian community that grew out of the Charismatic Movement of the 1960s and 1970s. Its mother church is situated in Homestead, Pa. and it has communities stretching from New England (including nearby Trumbull) to Hawaii and in Africa, Lebanon and Ireland. 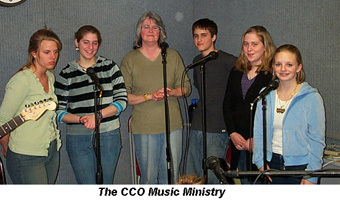 Alison hails from Vermont and is an integral part of the community’s music ministry, considered a very important element of its worship services. 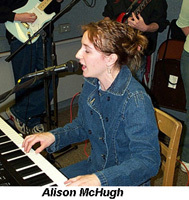 Alison was joined at WSHU by nine other musicians and singers for a spirited 75 minutes of Christian music that incorporates many styles and traces of music from folk and bluegrass to pop and rock to African and klezmer. Many of the song texts are from the Old and New Testaments of the Bible. Our thanks to WSHU Chief Engineer Paul Litwinovich for not only engineering the show but also arranging for the CCO Music Ministry’s appearance. The group was in the region to participate in a larger Easter Cantata being presenting at Sacred Heart University, WSHU’s home base, the following evening. 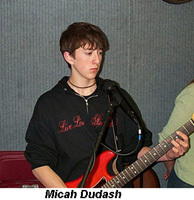 To learn more about the music ministry and its “Kids in Kenya” CD, check out www.kidsinkenya.com. The Community of the Crucified One can be reached at (412) 462-9537. We finished up the night with old friend Bruce Davies from Scotland (on record) who was appearing in concert and at worship services in Darien, Conn. this weekend.